Soooooo there has been a "battle" between Facebook and Twitter. Not just the two social websites itself but also with its users. As a a Facebook and Twitter user, I like them both very much. I find that they are both different in their own way. They are both important to me. Others say,"Facebook has so much more," or ,"Twitter is so much more fun." To me, I think I like them both just about the same. Twitter is made mostly for businesses or celebs. Others would argue that it's made for personal use too. And it is, but Facebook is even more for personal use. Also, Facebook has a option to make a public page for a businesses. To be honest, I don't like Facebook for a businesses. I think Twitter is much better for that. The good thing about twitter is that you can have fun with a personal account. While you can also advertise even more with your businesses. On Facebook, it's not made for businesses as well as twitter is. So twitter you have more advantages with both personal and business. On Facebook, it's better for personal. But, others may argue. What do you think? 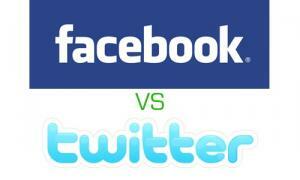 Do you like Facebook or twitter better? Why? Let this be the Great Debate on Social Media.